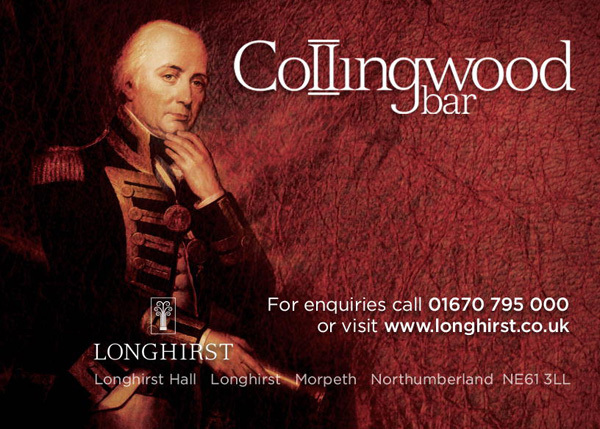 When Stephen Cowell, the Chief Executive of the Longhirst Group, was considering a theme for Longhirst Hall’s new bar, he didn’t have to look far. 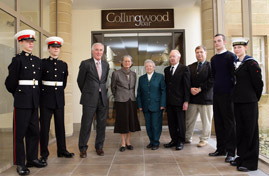 With the beautiful Hall located close to Morpeth and Stephen being a self-confessed enthusiast of the Admiral, Collingwood was the natural choice. Stephen approached the Festival Committee and asked if we would like to get involved in the launch of the new premises, something we were only too pleased to do. 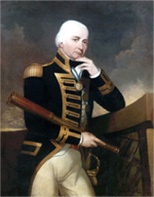 Together with his managers, he was planning two events: First of all, there was a quiet inaugural ceremony and the raising of a glass in tribute to Collingwood. 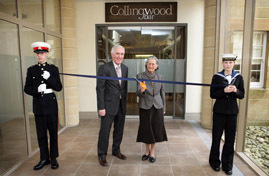 On 7th April 2010, Susan Collingwood-Cameron, the Admiral’s great-great-great niece performed the ribbon-cutting in front of a small group of management staff, Tom and Irene Lawson-Paris (Tom is a descendent of the original owner), Captain Stephen Healy of the Collingwood 2010 Festival Committee and four Sea Cadets from the local (Ashington) unit. This was followed on 29th April by a grand official opening day, when guests were able to see the full range of conference, sporting, hotel and dining facilities offered at the Hall, culminating in a sumptuous dinner in the restaurant. Longhirst Hall was built between 1824-8 for local landowner, William Lawson, and it is considered to be one of architect John Dobson’s finest buildings. The impressive mansion, with its extensive grounds, was bought by self-made coal mining magnate James Joicey in 1887 and it remained in Joicey hands until 1936. Used in various roles over the next 40 years, including a Remand Home, it stood empty for several years before it was bought, restored and converted into a country house hotel and conference centre. A popular wedding venue, Longhirst’s many sporting facilities include cricket grounds, a golf course and all-weather, floodlit tennis courts, football and hockey pitches. The 200 seat bar is part of an impressive £2m development at the Hall. Appropriately, the bar serves two recently launched drinks, the Official Collingwood Festival Ale from Wylam Brewery and the Royal Sovereign Rum from the Northumbria Spirit Company and it offers the best of British bar meals prepared by hotel head chef, Graeme Toms. These include a tempting Northumbrian Steak and Collingwood Cask Ale Pie, alongside other locally-sourced dishes. 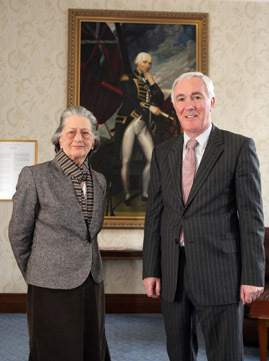 And if you do go to Longhirst Hall, be sure to find the magnificent full-length portrait of the Admiral. A letter recently appeared in the “Newcastle Chronicle”, (rightly) bemoaning the lack of pubs on Tyneside and in Northumberland named after our local hero Collingwood. At least Longhirst Hall has done something about that….